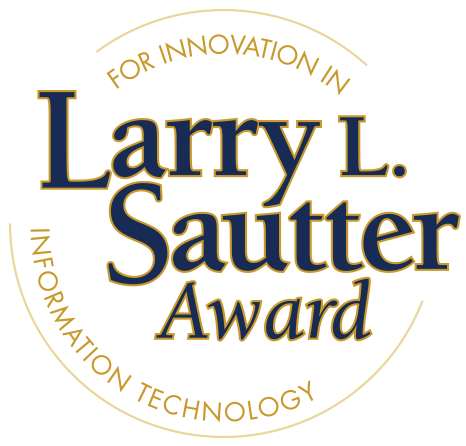 The Larry L. Sautter Awards were established in 2000 in memory of Larry Sautter, the UC Riverside CIO who was known as a tremendous collaborator and one who leveraged great ideas from across the system. It is now a tradition to hold the annual Larry L. Sautter award ceremony at UCCSC. This year, it will be held on Tuesday, August 14 at 4 p.m. in the Mondavi Center's Jackson Hall. The Sautter Award honors projects developed by faculty and staff in any department at the ten UC campuses, five medical centers, the UC Office of the President (UCOP), Agriculture and Natural Resources, Hastings College of the Law, and the Lawrence Berkeley National Laboratory. The selection committee includes members of the IT Leadership Council. More information about the program, as well as previous award winners, can be found on the UC IT website.